Casey meets a young boy named Josh who wants to buy a red kite and after he loses his quarter at Jungle Karma Pizza proceeds to steal a tip in order to go back and buy the kite. Casey chases after him and tries to teach him that to do the right thing is not always the easiest thing and that the Power Rangers, who the boy idolises, don’t like thieves. Meanwhile Dai Shi summons the Sky Overlord Carnisoar to become his new master and help him become powerful enough to defeat the Power Rangers. 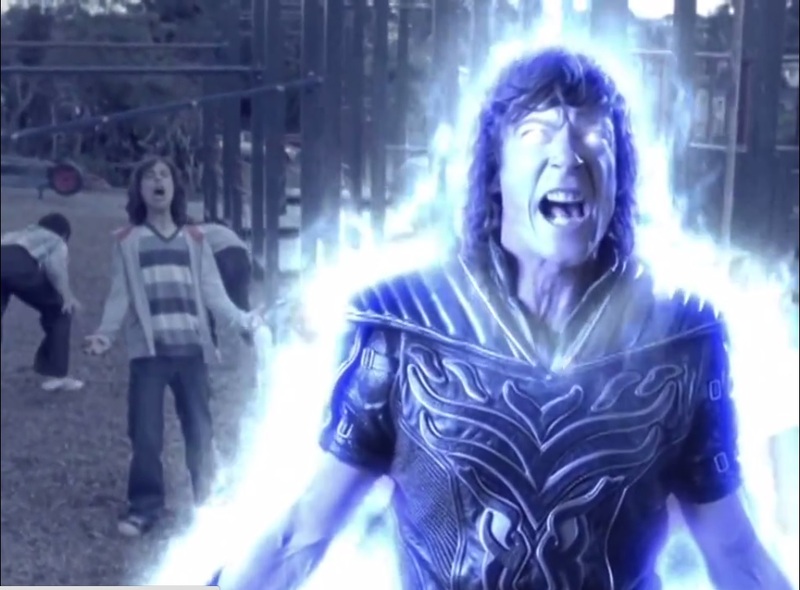 In order to do this the Sky Overlord helps him purge all remaining good from Jarrod who remains part of Dai Shi by making him look back on Jarrod’s life and undoing all the good he did to make him purely evil. At the same time Camille unleashes the slimy Slickagon against the Power Rangers. How many slime puns can you make in 22 minutes? However many it is I bet this episode would beat your score. From the moment Camille unleashes Slickagon the puns come thick and fast from nearly everyone and while I did start rolling my eyes after a while a sneaky grin still came on my face. The goofyness of Power Rangers is one of the reasons I love it but it overshadows what is a genuinely effective enemy. All the Power Rangers’ attacks in the early battle don’t have the desired effect because his slime keeps deflecting them away and its not until Casey gives him a rub down (yes I went there) that they can finally start putting hits on him. Slickagon was a wonderful villain-of-the-week being camp, amusing and effective but I think he served his purpose and I wouldn’t want to see him reintroduced again. I have started to notice a pattern with recent Jungle Fury episodes and that is the rangers’ stories tend to be average but the bad guy stories are brilliant to watch and this was no exception. Let’s just get the Josh story out of the way shall we. Yes this is one of a million Power Rangers episodes where they try to teach a lesson about right and wrong. For new fans to the franchise for whom Jungle Fury is their first experience of Power Rangers then this doesn’t seem so tired but for long timers like me we have seen this countless times. That’s not to say it’s bad or that the child actor was bad or anything it’s just a moral story that we have seen countless times and I would trade that for more character development of our heroes. But speaking of character development. Jarrod/Dai Shi looking back on his life was fascinating to watch and Bede Skinner did well in this with some brilliant yet subtle acting showing how he is still torn between his good and evil sides. There was some genuinely sad moments as we see his past getting rewritten and since the only thing we ever knew about Jarrod from the pilot was that he was a bit of a douche it was good to see that he wasn’t always that way. And as the story progresses we see it get easier and easier for Dai Shi to finally suppress Jarrod hinting that evil is winning. Really enjoyed this story. An enjoyable romp that actually goes a long way to make up for Way of the Master. Memorable Dialogue: (Casey) The real question is where did all these kids come from? (RJ) It’s the perfect storm. The new toy store down the road has revitalised the pizza business. Not that I care about money but I will be out of the red in about five years. (Fran emerges from the kitchen after an explosion) Sorry…My bad. Reblogged this on Eurylade Reviews. Looking for a specific episode? Enter your email address to follow this site and receive notifications of new reviews by email.